Danny Lennon says he still has ambitions to be a full-time boss again after celebrating a decade in management. The former St Mirren boss, who started with Cowdenbeath in 2008, has pulled the Bully Wee back up to a challenging position after a good November that has earned him the Ladbrokes League Two manager of the month. And it’s a Clyde double as young centre back Dylan Cogill has been named Player of the Month. Lennon, who has been in charge in Cumbernauld for a year, said: “I don’t know where the 10 years have gone – it’s flown in. “There must have been periods of these 10 years that have been good. “Sometimes you need to take a step back and I still have that ambition to go full-time again. “I believe I can get back to that level. You have to have dreams in football. “I think there is an expectation that a club like Clyde should be doing better but we have to accept where the club has been for the last eight-10 years. 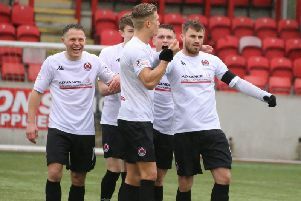 Clyde won away at leaders Edinburgh City and Elgin in the month and now face Berwick today as they aim to keep the pressure on City and Peterhead. Lennon added: “To get close to the teams above us in the last month has been very pleasing and the key now is to maintain that. “We only have to recollect that after a four-game run of wins we then lost n the Cup and also two league matches. “But we are striving to make sure that we do keep challenging. “It’s great to see Dylan Cogill doing so well having adapted from full time to part-time football. Cogill had not featured since August when Lennon brought him back in at the beginning of last month. He said: “I had suffered a few injuries but I have been back in and hopefully I can really kick on now. “The senior players have really helped me and the manager believes in me so that’s been a great platform for me. “I would love to play full-time football back in England and some point and get to the highest level I can.